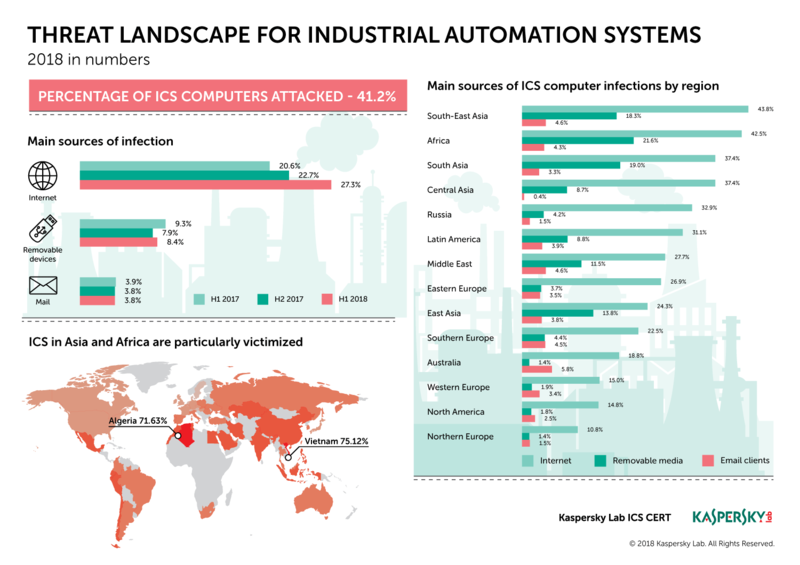 More than 40% of all industrial control system (ICS) computers protected by Kaspersky Lab solutions were attacked by malicious software at least once during the first half of 2018 – where the Middle East (ME) countries were among the top 20 countries by percentage of ICS computers attacked during the period. The most impacted countries turned out to be Vietnam, Algeria and Sri Lanka, while the safest region for industrial machines was Denmark. These are among the main findings of the Kaspersky Lab ICS CERT report on the industrial threat landscape in H1 2018. Cyber attacks on industrial computers are considered to be an extremely dangerous threat as they cause material losses and production downtime for a whole system. Moreover, industrial enterprises knocked out of service can seriously undermine a region’s social welfare, ecology and macroeconomics. Statistics collected by Kaspersky Lab researchers show that this kind of threat is of growing concern. In the first half of 2018, 41.2% of ICS computers were attacked at least once. Moreover, this is a continuation of a trend: in 2017, the figure increased from 36.61% in the first half of the year to 37.75% in the second half. Top countries by the number of ICS computers attacked in 2018 were Vietnam, where 75.1% of ICS computers were attacked, Algeria, with 71.6% and Morocco with 65%. As for the least attacked industrial facilities, the top three countries turned out to be Denmark with 14% attacked computers in industrial enterprises, followed by Ireland with 14.4% and Switzerland close behind, accounting for 15.9%. 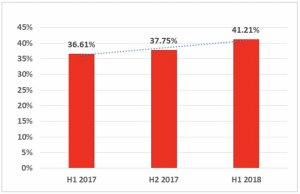 Countries in Africa, Asia and Latin America were significantly worse off in terms of the percentage of ICS computers attacked in regions in H1 2018 compared to H2 2017 with Africa taking 2nd place and the Middle East coming in at 8th. Within geographical regions, the figures can vary significantly between different countries. For example, the situation in South Africa is the most favourable compared to most African countries, and Israel and Kuwait are noticeably better off than other countries in the Middle East. The largest number of threats come from the internet, which over the years has become the main source of infection for ICS: 27% of threats are received from the world wide web; while removable storage media is ranked second with 8.4%. Mail clients occupy third place in terms of volume– they represent 3.8% of threats. “The percentage of cyber attacks on ICS computers is a concern. Our advice is to pay attention to systems’ security from the very beginning of their integration when the systems’ elements are first connected to the internet: neglecting security solutions at this stage could lead to dire consequences,” says Kirill Kruglov, security researcher at Kaspersky Lab. Regularly update operating systems, application software and security solutions on systems that are part of the enterprise’s industrial network. Restrict network traffic on ports and protocols used on edge routers and inside the organisation’s OT networks. Deploy dedicated endpoint protection solutions on ICS servers, workstations and HMIs to secure OT and industrial infrastructure from random cyber attacks; and network traffic monitoring, analysis and detection solutions for better protection from targeted attacks. Read the full version on Securelist.com. Kaspersky Lab is a global cybersecurity company, which has been operating in the market for over 20 years. Kaspersky Lab’s deep threat intelligence and security expertise are constantly transforming into next-generation security solutions and services to protect businesses, critical infrastructure, governments and consumers around the globe. The company’s comprehensive security portfolio includes leading endpoint protection and a number of specialized security solutions and services to fight sophisticated and evolving digital threats. Over 400 million users are protected by Kaspersky Lab technologies and we help 270,000 corporate clients protect what matters most to them. Learn more at www.kaspersky.co.za.